Original 36”x24” oils on canvas is for sale, please contact us for details. Wing commander Allen Geoffrey Page DFC, flying his personal Spitfire Mk.IX ‘AGP’ leads his 132 Squadron wingman on a fast, low-level precision bombing strike on enemy coastal defenses ahead of the British forces landings on “Sword Beach” Operation Overlord, June 6th 1944. Released from their payload the Spitfires tear across the dense hedgerow terrain in search of any likely targets of opportunity before returning to their UK base to rearm and refuel. 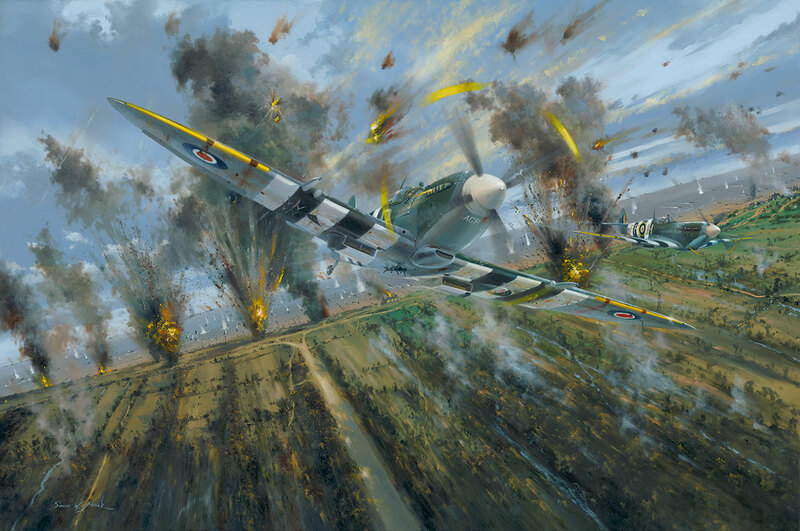 Many Spitfire sorties on D-day and after saw the legendary fighter used as a ground-attack fighter bomber for precision strike operations like this. Carrying a pair of 250lb bombs, one under each wing and a single 500lb bomb under the belly “Spitbombers” were a very effective ground attack weapon system, backed up with potent strafing fire from the twin Hispano 20mm cannons and four .303 guns. 132 Sqn were employed in just this manner and under Wing Commander Page’s superb leadership, this squadron became one of the most effective air support units on D-Day and beyond: becoming one of the first allied fighter units to operate from Normandy itself. Shortly after D-Day 132 Sqn were flying sorties from Longues-Sur-Mer during which time, Page took over command of 125 Wing from Wg Cdr Johnnie Johnson; winning the Bar to his DFC. His citation for this award reads…. Wing Commander Geoffrey Page was one of the most remarkable and courageous RAF leaders of the war. After being severely burned, almost to death, in a 56Sqn. Hawker Hurricane cockpit fire and with bullet wounds in his legs during the Battle of Britain, he became one of Sir Archibald MacIndoe’s pioneering “Guinea-Pigs” in plastic surgery at East Grinstead Hospital. Page underwent 15 gruelling major operations to rebuild his face and hands and, despite being told his flying days were over, by sheer unconquerable determination and MacIndoe’s outstanding surgery, he returned to full-operational flying status in 1942. Vowing to shoot down an enemy aircraft for every one of his operations at East Grinstead. He was known to have engaged and shot-down 14 enemy aircraft, recorded with this Spitfire alone when, in September 1944 he suffered a crash landing in which he broke a small bone in his back and brought his wartime flying career to an end. He had at least, achieved his avowed target of 15 enemy kills; with 10 solo, 5 shared, 3 damaged. 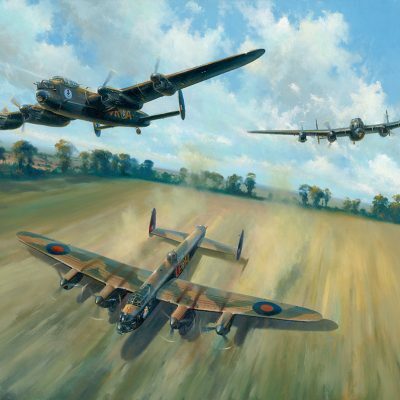 Added to which are 2 kills made during the Battle of Britain and a remarkable single day’s action south of Paris on June 29th 1943 when, flying as wingman to Squadron Leader James MacLachlan, the pair shot down 6 enemy aircraft in 10-minutes. For this action, Page won his DFC. Remarkable enough too, is the fact that MacLachlan had lost an arm in combat over Malta in 1941. Like Page, he too had overcome his disability and emerged a formidable fighter pilot. Wing Commander Geoffrey Page ended the war decorated with the DSO. DFC and Bar. He was made an Officer of The Order of Orange Nassau by Queen Wilhelmena of the Netherlands for his part in the battle for Arnhem. In peacetime Wg Cdr Page’s last command was 64 Sqn. flying the deHavilland Hornet. In 1948 he left the RAF to become a sales executive for Vickers Armstrong and later, as a successful Swiss-based Aviation consultant. But his retirement was spent devotedly to being a driving force behind fund raising for the Guinea Pig Club as its chairman. He wrote his autobiography “Tale Of A Guinea Pig” in 1981. And as founder of The Battle Of Britain Trust; raising over £1 million to create the Battle Of Britain Memorial that overlooks the straits of Dover. For this work he was awarded the OBE created Officer of the Order of the British Empire in 1995. Wing Commander Geoffrey Page died on 3rd August 2000. Survived by his wife, a daughter and two sons. Copyright.Image and Text Simon W. Atack 2014.